WHY BECOME A Community League MEMBER? Did you know that Community League facilities are managed and operated completely by COMMUNITY VOLUNTEERS? The City of Edmonton provides the land and contributes some programs and resources, but the City does NOT manage or maintain any of our facilities (hall or rink). Work is done by community volunteers and most funds are via volunteer fundraising projects. Want to have a nice ice surface to skate on? JOIN US. Any help would be greatly appreciated by those who are already spending countless hours volunteering their time to provide this to the community. There are many other opportunities to help out too. But the FIRST and foremost important thing: Become a member. Community League membership is the foundation of all this, and it's literally pennies per day (now rounded off to nickels, of course 🤣). We look forward to seeing you! Membership Benefit Update- Swimming at Terwillegar: As many of you are aware, we switched our swim location from the William Lutsky YMCA to Terwillegar Recreation Center back in September. We did this after numerous comments about wanting a better swim location & the low usage at the YMCA. Since making the change, we continue to see low membership usage of our Community League swim time. At our AGM, we stated the switch to Terwillegar Recreation Center was a pilot project for the 2018-2019 membership year. If the Community League usage did not increase then the Board of Directors would consider removing swimming as a benefit of membership. If you want to see a Community League swim time remain as a benefit of having a community league membership, please start using the Terwillegar swimming facility on Saturday's from 5-7pm. Calling all residents PLEASE DO YOUR CITY CENSUS- The information is used by various facilities, organizations and stakeholders to deliver a wide range of municipal services including schools, recreation centres, emergency services and major infrastructure. " Our community operating grant is based on the number of residents living in our community." So please participate in this important process. The use of tobacco and cannabis (smoking, vaping, etc.) is prohibited within 10 metres of parkland space which contains a school, community centre, parking lot, playground, rink, or sports field. Basically, you can not use tobacco or cannabis anywhere in the entire park space around the community league facilities and school. Best to stay at home to do your smoking and/or vaping. You can refer to City of Edmonton Bylaw 14614 (Public Places) for more details. Community League facilities are monitored by security resources including recorded video 24 hours per day. 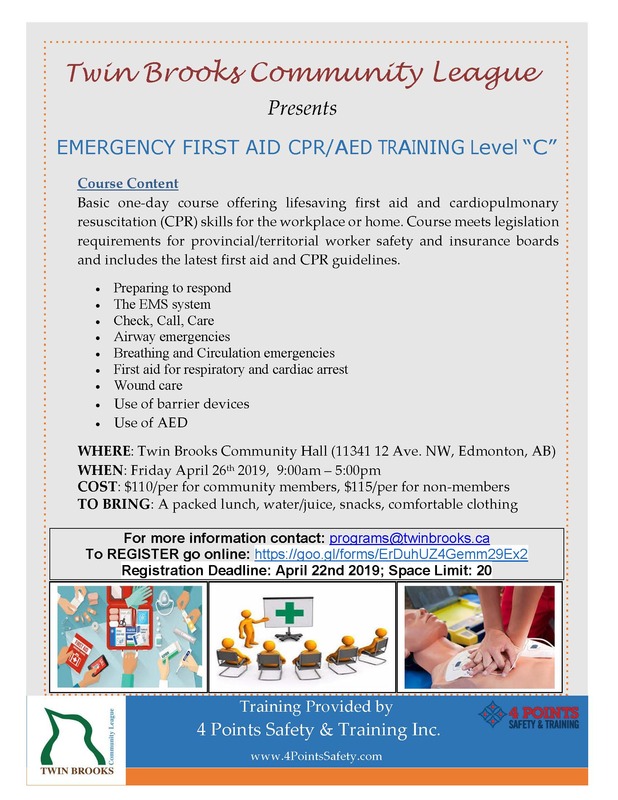 April 26th 9:00am-5:00pm- Emergency First Aid & CPR Training Course- see poster below for more info. 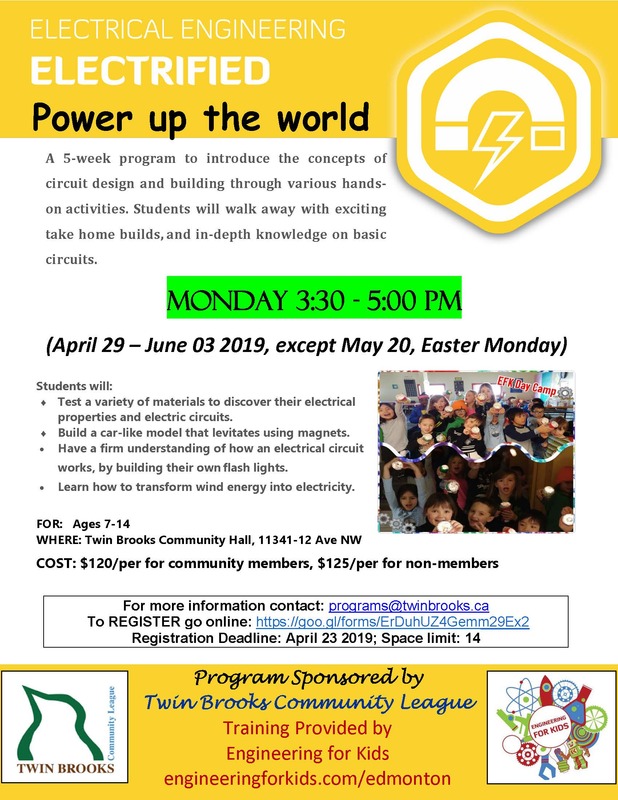 Engineering for Kids Presents "Power Up the World" program for kids aged 7-14 offered Monday's 3:30-5:00pm April 29-June 3rd. See poster below for more info. 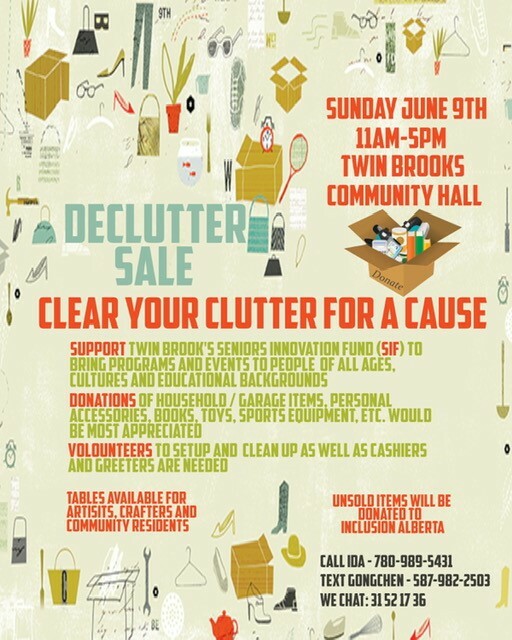 Sunday, June 9th 11am-5pm- Garage Sale. See poster for more info. 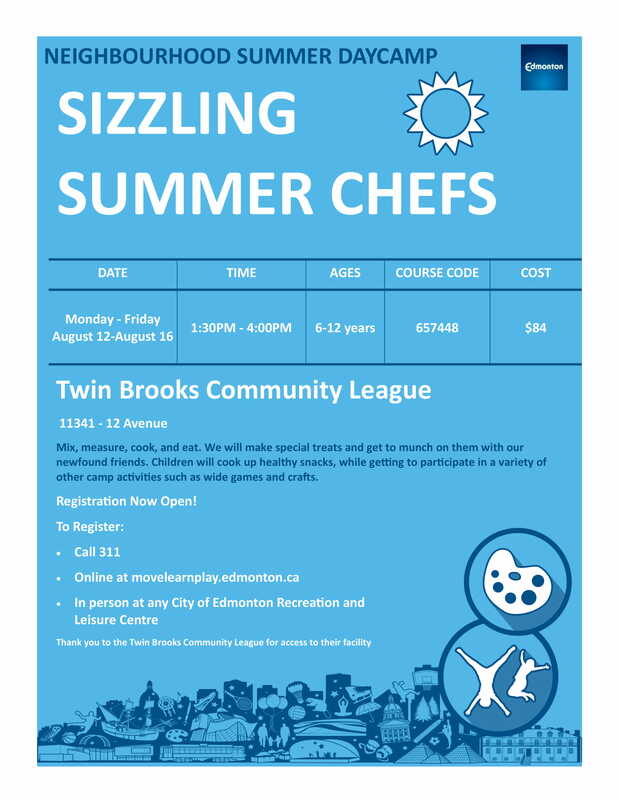 City of Edmonton Summer Program- "Sizzling Summer Chefs" August 12-16th See below for info. on registering.